The Vizsla is a dog breed originating in Hungary. 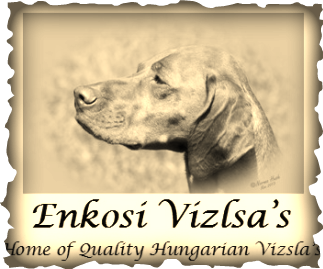 The Hungarian or Magyar Vizsla are sporting dogs and loyal companions, in addition to being the smallest of the all-round pointer-retriever breeds. The Vizsla's medium size is one of the breed's most appealing characteristics as a hunter of fowl and upland game, and through the centuries the Vizsla has held a rare position among sporting dogs – that of household companion and family dog. The Vizsla is a natural hunter endowed with an excellent nose and an outstanding trainability. Although they are lively, gentle mannered, demonstrably affectionate and sensitive, they are also fearless and possessed of a well developed protective instinct.